A computer rendering of the proposed Nordic Aquafarms site in Belfast. The company is preparing to apply for permits, with hopes of starting construction in spring of 2019. 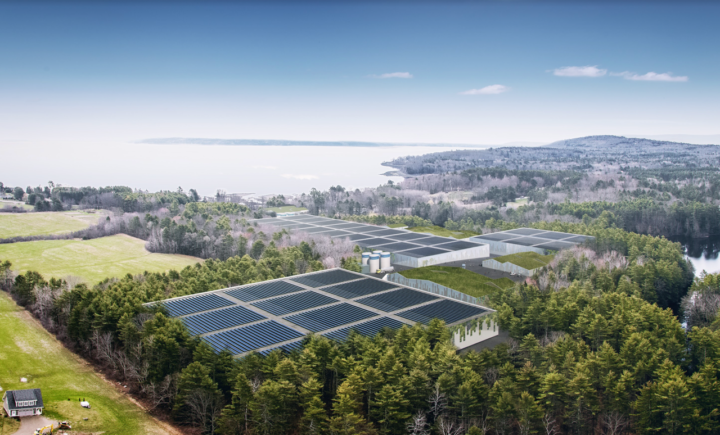 BELFAST, Maine — You might have to squint through the trees to spot the world’s second largest salmon farm in Belfast, according to computer renderings unveiled Wednesday. Nordic Aquafarms, a Norwegian aquaculture firm, says its due diligence, the process used to determine whether the project would be feasible, is about 90 percent complete, and is ready to start applying for permits. Nordic hosted its latest information session at the Hutchinson Center in Belfast on Wednesday night. In its first phase, Nordic would build a 300,000-square-foot building on a 40-acre plot near the Northport town line. 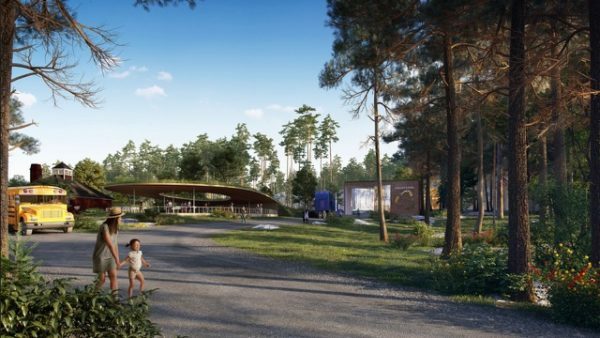 The building will be about 10-15 feet shorter than surrounding trees, largely hiding it from view, according to Nordic’s CEO Erik Heim. Early designs of the farm show a white structure with tall windows meant to reflect foliage in warm months and snow in winter. Another design option Heim showed Wednesday featured green stripes on the lower half of the building to simulate trees. “We’ve heard the concerns, and really want this building to integrate into the landscape in a soft way,” Heim said Wednesday. Off Route 1, the company says it will keep the historic waterworks building and dam and plans to convert it into an information center for school groups and the public. It also has offered to build an outdoor display tank to hold salmon for public viewing, if that’s something the city wants. Later, the company plans another 200,000-square-foot building, again surrounded by trees, closer to Perkins Road. The farm’s roofs will be covered in solar panels, providing about 6-10 percent of the facility’s electricity, according to Heim. 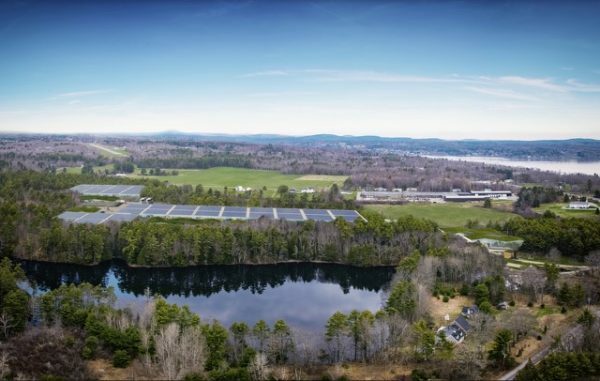 The company plans to invest $150 million in the farm, which would produce 33,000 tons of Atlantic salmon per year. Later stages of development could bring the investment to $500 million. Local activists have expressed skepticism about the project. Opponents have argued that the project is moving too fast, and pleaded with the city council to deny a zoning change request. The council unanimously backed the zoning change, saying it would lead to a 6-month delay that could kill the project in its infancy. Their concerns range from the loss of woodland on the 40-acre development site, to the water the facility will consume and discharge, to a general belief that fish shouldn’t be raised in farms. Based on test wells dug across the site in recent months, Nordic and its environmental consultants say the farm could sustainably draw 1,200 gallons of fresh water per minute. Because the site sits at the end of the aquifer, the water that is drawn would normally just flow into the bay without being tapped. Heim said that’s more than enough supply, given the fact that the facility will use mostly saltwater and has a contract with the city’s water district to purchase a minimum of 100 million gallons of municipal water to Nordic each year for six year. Had the aquifer only been able to produce about 600 gallons per minute safely, Nordic might have had to start searching for a different site, Heim said. 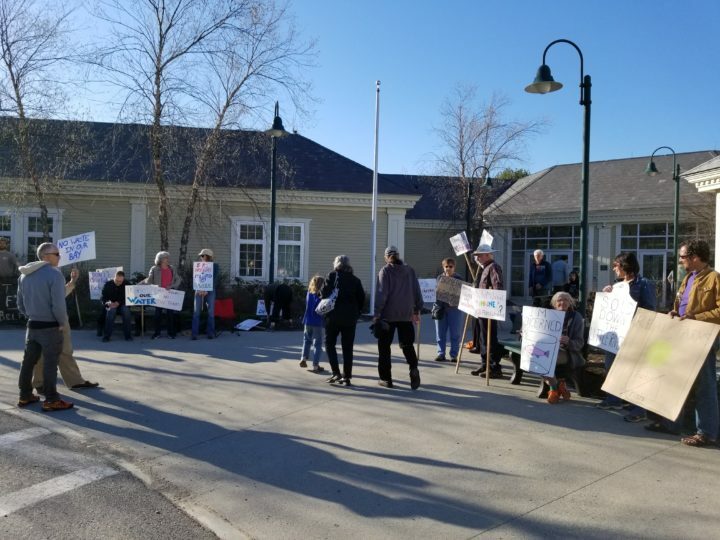 About a dozen protesters gathered outside an informational meeting on the Nordic Aquafarms on Wednesday, May 9, 2018. Some locals have expressed concerns about how the project will affect the community and the bay. Nordic plans on heavily filtering and treating the wastewater produced by the fish in the tanks before discharging it into Penobscot Bay. That’s a step that hasn’t been traditional in indoor farming, and is impossible in pen farming. Before treatment, discharge would include about 37,500 pounds of suspended solids. After it’s treated, only about 380 pounds would enter the bay. Phosphorous, one of the more concerning nutrients because of how it influences algae growth, will drop from more than 1,000 pounds daily to six pounds after treatment. That’s roughly the equivalent of what’s produced by rainwater runoff from 10-15 lawns, according to Elizabeth Ransom, an environmental consultant working on the project. Nitrogen will be reduced about 60 percent, but about 1,600 pounds per day is expected in the discharge. Heim said he expects that will fall well within limits set by environmental regulators. The Maine Department of Environmental Protection will set discharge caps during Nordic’s permitting process. “We’re building our brand on sustainability, and we have to talk the talk and walk the walk,” Heim said. The discharge pipe will run about a mile into the bay, where the tide would help dissipate any pollutants and prevent nutrient concentrations from becoming too high in any one area. Extra feed and fish feces will be filtered out and sold as fertilizer or for biogas production. Fish guts will be frozen and sold off to other companies for making fish oil, supplements or other uses. Before a shovel hits the ground, Nordic must earn approvals and permits from federal, state and local agencies, ranging from Belfast’s planning board to the Army Corps of Engineers. Several of these permits will require public hearings. The first applications could be submitted sometime next month. Construction is expected to start in the spring of 2019. Nordic will open an office in downtown Belfast this summer. Heim plans to move from Norway to Maine in late September or early October to oversee the final phases of planning and get the facility off the ground. Two other U.S. salmon farms are in the works. Atlantic Sapphire in Miami, Florida, is under construction with nearly triple the capacity of Nordic. Whole Oceans is planning a farm just 20 miles upriver in Bucksport with a projected 5,000-ton annual production. The sudden interest in a U.S. salmon production market sparked recently when the price of indoor recirculating aquaculture technology started to fall in line with increasing costs for offshore aquaculture pen operations. All Atlantic salmon consumed in the U.S. is farm raised, and about 95 percent is imported by plane from Europe, Chile and Canada. The companies say they’ll be able to offer a fresher product in the U.S., and at a lower price because they’ll avoid the substantial shipping charges that come with sending refrigerated salmon overseas. With the global population continuing to swell, and a growing strain on sustainable wild fisheries, demand for farmed fish expected to double by 2050, according to the World Resources Institute. Follow Nick McCrea on Twitter at @nmccrea213. Follow the Bangor Daily News on Facebook for the latest Maine news.